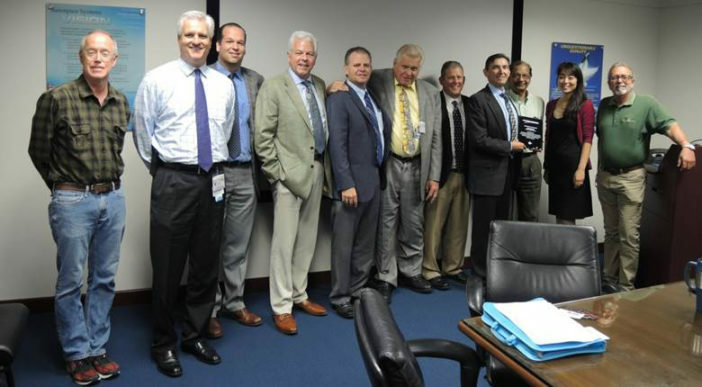 (Pictured left to right) Northrop Grumman’s Todd Jameson, Bron AeroTech’s Mike Flynn, Joey Naperala, TJ Knowles, Mike Shand, James Flynn, Brett Jones, and Leonard McLaughlin, and Northrop Grumman’s Ashok Roy, Nikki Kodama and Donald Gillespie. Bron Aerotech, an aerospace specialty materials supplier, has been honored by Northrop Grumman Corporation’s (NYSE:NOC) F/A-18 program leaders for providing new and innovative product solutions to support F/A-18 program affordability initiatives. Employees of Bron Aerotech were recognized recently for their dedication and commitment as a valued supplier and industry partner during an F/A-18 awards ceremony at Northrop Grumman’s manufacturing facility in El Segundo, California. Northrop Grumman performs more than 40 percent of the work required to produce the F/A-18 Super Hornet and the EA-18G Growler (EW-variant). As the principal subcontractor to Boeing, the F/A-18 prime contractor, the company produces the center/aft fuselage and vertical tails, and integrates all related systems, helping to make the F/A-18 one of the most affordable, capable, and low-risk strike fighter solutions currently available. To date, Northrop Grumman has produced more than 2,200 F/A-18 and EA-18G shipsets, including more than 700 F/A-18 E/F Super Hornet Shipsets. It also provides post production support for the jet, which includes engineering services and structural upgrades. Bron Aerotech sources, stocks and supplies engineered films, fabrics and tapes that meet aerospace OEM specifications and perform in the application. Working with its manufacturer partners, Bron Aerotech provides material solutions drawn from existing, low-cost industrial materials, or develops unique, custom products specifically designed to fit the bill. The company also provides material updates to its aerospace customers. Please visit bronaerotech.com for more information.